London UK, and Guildford, UK, 16 February 2017: Lime Microsystems and Canonical have today announced the upcoming launch of the second round of crowdfunding for LimeSDR the flexible, next-generation, open source Software Defined Radio. The new campaign called LimeNET is intended for use primarily as a mobile and IoT base station. 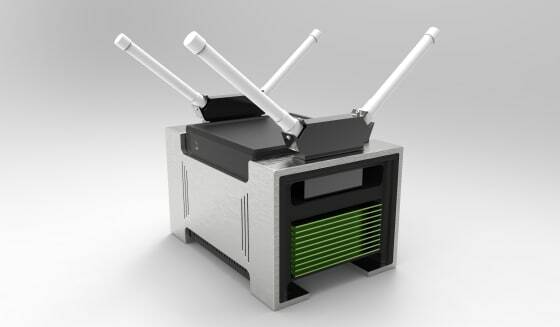 LimeNET base stations hold the potential to completely transform the way telco networks run by shifting the emphasis and value away from proprietary hardware to open hardware with app stores on top. To be notified of when the campaign is live please register here. Confronted with flat revenues, spiralling infrastructure costs and massively escalating data demands, the telco industry is facing a crisis point. It needs exponentially more cost-effective solutions, as well as new revenue streams, and needs to find them quickly. Operators face a simple choice; either revise their business models, or lose market share to new incumbents. Lime Micro and Canonical are looking to turn the mobile telephony business model on its head. Telco hardware is expensive, slow to develop, and has proven a ‘break’ to innovation in the industry. By ‘open sourcing’ Lime Microsystems’ 5G and IoT capable SDR base station design, Lime and Canonical are looking to effectively ‘commoditise’ network hardware and shift the value centre towards software. LimeSDR-based base stations can not only run cellular standards from 2G or 5G, as well as IoT protocols like LoRa, Sigfox, NB-IoT, LTE-M, Weightless and others but any type of wireless protocol. Open source base stations allow R&D departments to try out new ideas around industrial IoT, content broadcasting and many more. Commoditised base stations allow any enterprise to run their own base station and get spectrum from their operators as a service. Base stations can have new form factors as well, like being embedded into vending machines or attached to drones. Over 3,600 developers are currently involved in efforts to create apps, called Snaps, for LimeSDR, with several free and paid-for apps having already appeared on the open community LimeSDR App Store, as well as Lime’s invite-only app store, LimeNET. Hailed as the ‘Arduino for telco engineers’1, LimeSDR’s first funding round met with considerable success. LimeSDR, together with Ubuntu Core, has been heralded as ‘democratising a critical part of telecoms networks’2, opening up the world of wireless to a wide range of developer-innovation. As a result of LimeSDR’s considerable potential to transform the industry the project attracted a number of large corporate telco sponsors, including BT’s EE, and eventually achieved nearly double its revenue target of $500,000. Other applications for LimeSDR include use as an IoT gateway, an aviation transponder, a utility meter, in media streaming and broadcasting, radio astronomy, RADAR, drone command and control, radio astronomy, and more. To find out more about the second round of LimeSDR crowdfunding visit the Ubuntu Booth in Hall P3 – 3K31 at Mobile World Congress to experience what is possible with open source base stations with app stores. Lime Microsystems specialises in field programmable RF (FPRF) transceivers and SDR boards for the next generation of wireless broadband systems. These products offer an unprecedented level of configurability and allow system designers to create wireless communication networking equipment that can be set and reconfigured to run on any wireless communications frequency and mobile standard. Lime’s technology has been adopted by organisations around the world for a wide range of applications from consumer communications equipment — femtocells and repeaters — to software defined radio devices for military and emergency services. Applications include comms infrastructure, disaster relief networks, M2M technology and test / verification systems. The company is renowned internationally for its analogue, mixed-mode and RF design as well as its expertise in end-system applications. Its technology enables a single platform design to be implemented anywhere in the world, regardless of the countless local standard / frequency variants. Lime works closely with industry partners to optimise RF and baseband solutions to ensure the ecosystem for the entire end equipment design is in place. Its partnerships help customers achieve high performance with lower device and manufacturing costs, less design resource and optimised inventory. Established in 2005, Lime Microsystems is a privately held company.